Psychiatric classification systems generate significant controversy, including criticisms of the expansion and redefinition of categories in the Diagnostic and Statistical Manual of Mental Disorders (DSM) and ICD-10 Classification of Mental and Behavioural Disorders (ICD). Nonetheless, these systems facilitate research and treatment and offer protections against inappropriate involuntary treatment. 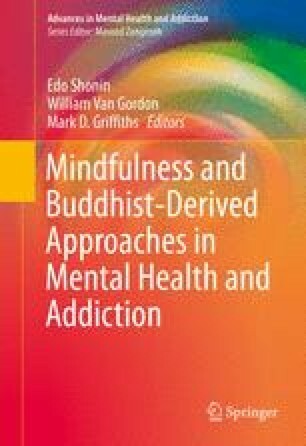 More skilful engagement with DSM and ICD would be facilitated by awareness of Buddhist teachings about ‘dependent arising’ and ‘nonself’ which refer to the idea that perceived phenomena (including the self) are entirely dependent on specific causes and conditions for their apparent existence and are thus without substance, permanence or independent existence. An approach to DSM and ICD informed by these teachings underpins the ideas that (a) clusters of co-occurring symptoms are impermanent and thus to be interpreted very flexibly; (b) the ‘self’ experiencing such symptoms is similarly devoid of lasting substance and subject to constantly changing forms of suffering (Pāli, dukkha; Sanskrit, duhkha); (c) compassion, as emphasised throughout Buddhism, is another necessary construct for skilful use of DSM or ICD: if there is no self, there can be no self-interest, and the suffering of others is continuous with one’s own; and (d) skilful, compassionate engagement with DSM and ICD requires cognitive flexibility when interpreting criteria, mindful awareness of the transitory nature of classification systems, consciousness of the complexity and impermanence of mental phenomena (as outlined in the Abhidhamma (Pāli; Sanskrit: Abhidharma) of Buddhist psychology) and the self and deep awareness that, in this context of constant change, you cannot diagnose the same person, or the same illness, twice.